Can You Rock It Like This? After three years without a single music video, Muck Sticky has returned with some straight fire! Literally! His new music video “Like This” features rap legend Al Kapone, and also features some amazing pyro! It’s official! 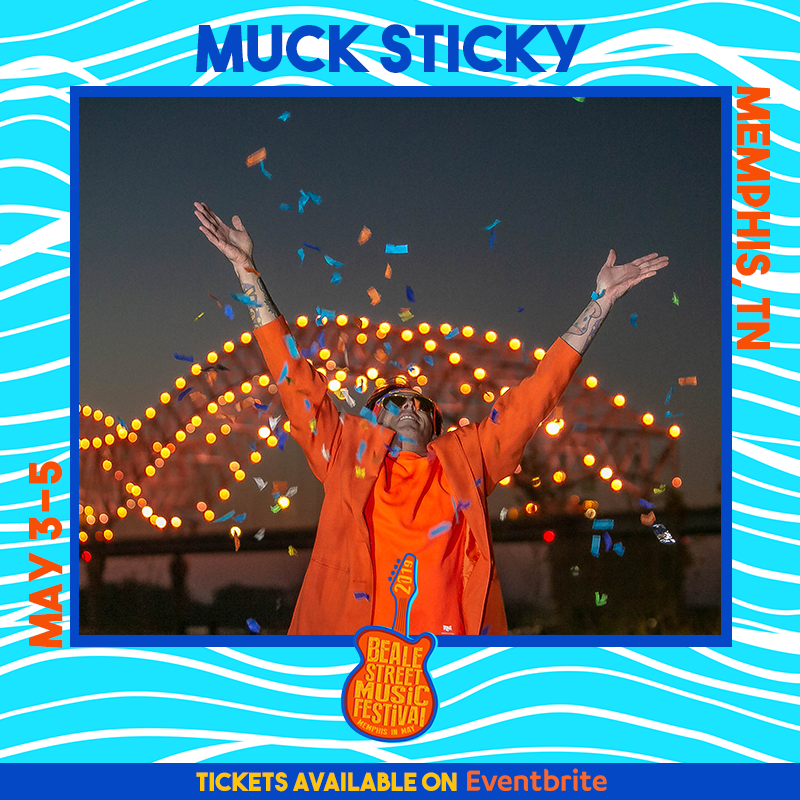 Muck Sticky will perform at the 2019 Memphis in May Beale Street Music Festival! This is our first Memphis show since 2015, and it’s been ten years since we rocked the BSMF stage last. We are thrilled to return and see all of our hometown friends at this legendary event. Last year was sold out, so get your tickets now at https://bsmf.eventbrite.com/?aff=BSMF19Artists and get ready for a great weekend of fun and music!!! Let’s party!!! 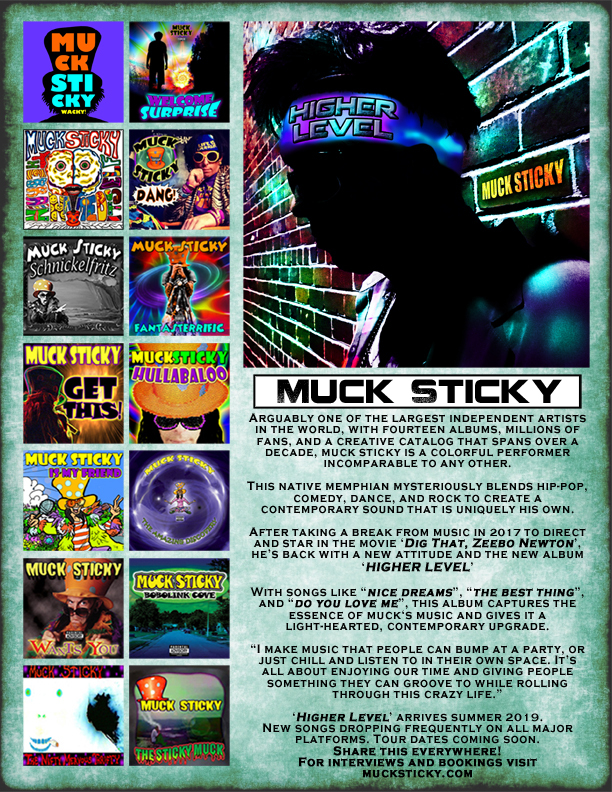 “Nice Dreams” is the second single from Muck Sticky’s 2019 album ‘Higher Level’. Download this song for FREE at SoundCloud.com/MuckSticky and subscribe to YouTube.com/MuckStickyTV and click “get notifications” to see brand new videos and hear new music as soon as we release it! A mother-and-son team of filmmakers are creating quite a buzz in the movie world with their debut film ‘Dig That, Zeebo Newton’, a story about a small-town misfit who gets bullied, fired from his job, threatened with eviction, then is abducted by the meanest family in town and held prisoner in their barn. 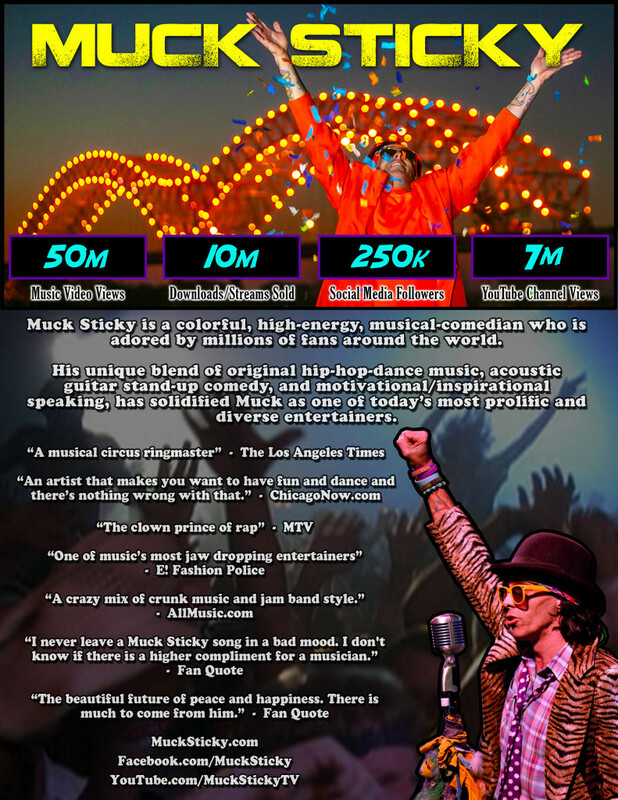 Award-winning recording artist Muck Sticky, and his mother, author Linda Kaye Lowery, co-wrote, directed, and star in this heartwarming tale that spent ten days as the number one independent preorder film on iTunes for the week of July 3rd, 2018. Known for his unique brand of comedic music and videos, Muck stars as Zeebo, a lovable goofball who runs afoul of a family of bullies known as The Hammerheads. Based on true events, but set in a fictional town, this film has won numerous festival awards including the Silver Award for Best Feature in the NYC Indie Film Awards. With an impressive supporting cast that includes Jerry “The King” Lawler (Man On The Moon, WWE Legend), Willie “Too Big” Hall (The Blues Brothers, Soul Men), singer-songwriter Keith Sykes (Jimmy Buffet’s Coral Reefer Band), and Oscar-winner Frayser Boy (Hustle & Flow), this movie was filmed on location in Memphis, Tennessee, and the cast features some of Memphis’ most iconic entertainment legends. ‘Dig That, Zeebo Newton’ is now available on Amazon, iTunes, GooglePlay, DVD, Blu-ray, and coming September 1st, 2018, to Comcast/Xfinity, DirecTV and Dish Network. I know I’ve been a little absent here on the blog lately, but we’ve been working really hard behind the scenes to bring you some fun stuff. We are still working to secure distribution, and hope to have a release date for you soon. Please stay tuned to Facebook.com/ZeeboNewton for regular updates. We are also in the early stages of bringing to life our 20th album. No title has been decided yet, but I promise to keep you posted as things progress. Thank you for your dedication and support. This is going to be a FUN YEAR!!! !